A rather gloomy morning, dark clouds and windy. So we decide against going ashore on another wet dinghy trip. Instead, we study the pilot book (oh, how we love these books and how we missed having one for New England), to find a very sheltered harbor. The wind is going to be very strong in the next few days, so we need to be safely moored and also protected from the swell. After we dismiss a couple of potential harbors, due to being too shallow or exposed, we agree to aim for Stonington, Connecticut. Mid-morning we slip the mooring line and start our journey across Block Island Sound. The wind is a nice 15kts and we should have the perfect point of sail, on a beam reach. But when we unfurl the main sail, its upper part gets jammed into the mast. We haven’t had this issue since our very early days on Cloudy Bay. We furl-unfurl few times, trying to release it, but with no luck. The next best bet is the let the boom right out, point into the wind and let the sail flap itself out from the trouble. Which it does, after few painful to watch minutes. Once we are set on our course, we have a brilliant sail. Good wind and flat water, just perfect sailing. At some point we notice one of the longitudinal mainsail battens has slipped from its pocket. How bizarre, we’ve never had that happening before. 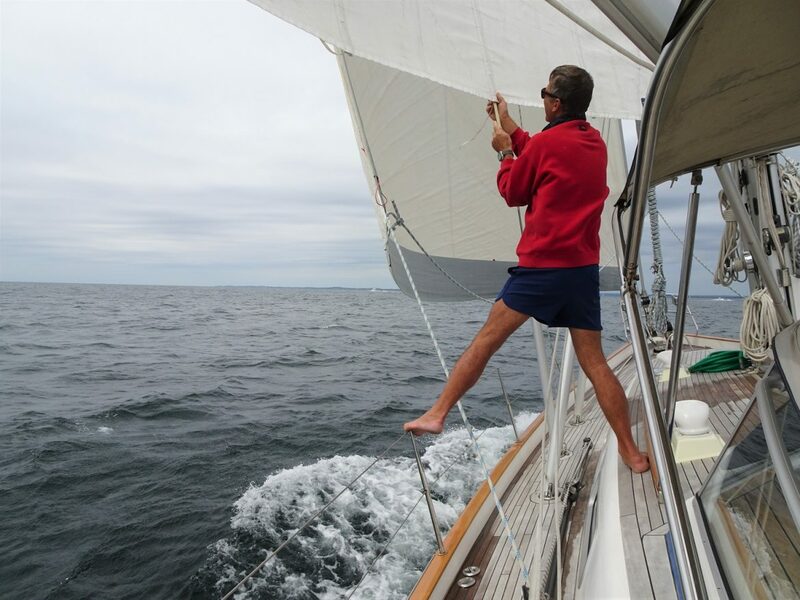 So Glen arms himself with the batten prodder, and holding on for dear life with one foot on the upper life-line, he pushes the batten back in. Phew, that was a close one. In the meantime, to add to the morning’s dramas, we notice the vang started leaking hydraulic oil, again. Aaggghhhrr. Bandage with absorbent pads is applied, and it will need to be addressed. And not to get ourselves too bored, the batten escapes yet again, and the same acrobatics is required to secure it back in place. Hm, what next? The wind is quite cold, and we get very chilly even in our protected cockpit and with thermal gear on. How we miss the Caribbean islands, where even when it was blowing, we were still only half dressed. As we set ourselves in the saloon to attend to the usual chores, we feel Cloudy Bay rocking. Hm, a boat must’ve passed by. Then it rocks again. And again. When we poke our heads out, we see the dreadful Atlantic swell coming into the harbor, parallel to us. Great! Exactly what we wanted to avoid. And in the next couple of days the sea will be boiling, so bigger swell will be coming in. Maybe we need to rethink our options. Since the weather is going to be so bad in the next days, we decide to book a hire car and go explore the area. Closest hire car place is at the New-London airport, and that is just a short Uber ride away. We will be land lubbers again tomorrow. We haven’t rented a car since Charleston. Later into the evening Glen starts looking at dockage for Bermuda, since we need to secure a place way in advance. Then at mooring options close to New York, and shipyards where we can haul out for antifoul and repair the damage produced by the collision. Then more video editing till passed midnight.